There’s much to be said about the rest of Robert Rodriguez’ Alita: Battle Angel. But the two things that stand out most about the film are actress Rosa Salazar’s performance, and how much work the movie’s VFX put into making her look like the most lifelike cyborg to ever set foot outside of the uncanny valley. This is what happens when we try to create one-to-one translations of manga characters. Body proportions look weird on screen, and characters who are meant to appear human end up looking anything but. Still, it’s impressive to see what WETA put into creating a version of Alita who could convey Salazar’s on-set physicality, something like her visage, and still manage to feel as if she was part of the world Alita is set in. How did they do it? With a process involving a hell of a lot of cameras, and the sort of mo-cap suit that’s become something of an industry standard at this point. 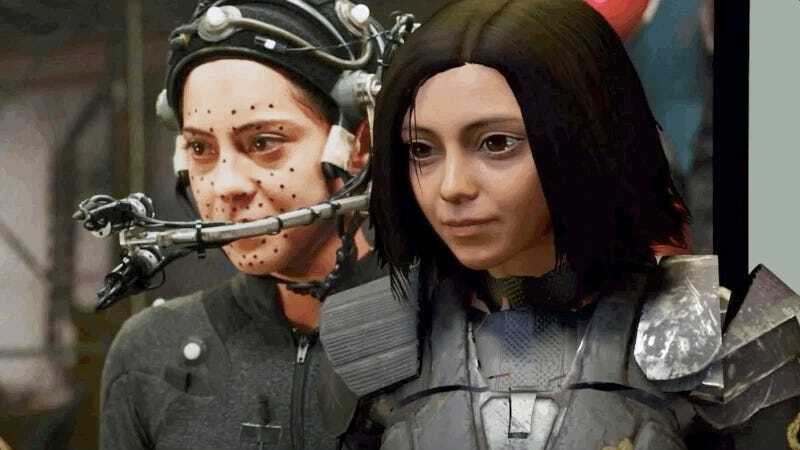 Seeing footage of Salazar in the suit before having her performance digitally altered, it actually makes you appreciate the moments in Alita that train on her face in order to show you the subtleties of her character’s emotions. In another world, with a slightly different aesthetic, Alita the cyborg might actually not have a gaze that haunts your nightmares. Alas, that’s not the world we live in. Alita: Battle Angel hits theaters February 14.